Our members are diverse, mature, and loving. We welcome everyone regardless of background or beliefs, from athlete to artist, warrior to nerd. Our children's classes include a nice mix of public, private, charter, and home school students. Stephen started Aikido in 1983 and apprenticed under Sensei Smartt in Stockton. He opened his first dojo in 1990 in Modesto and his Grover Beach dojo with his wife Maureen in 2005. Sensei Stephen is the director of the Youth and Adult program. 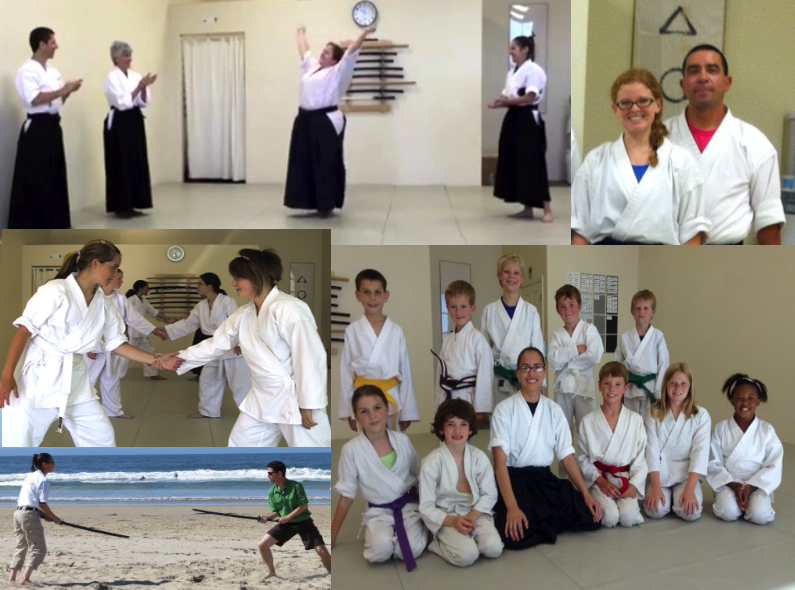 Teresa began her aikido training in 2007 and apprentice d under Sensei Steger a year latter. Sensei Mitchell is the director of the Pre-Juniors and Juniors program. Sensei Steger has been a guide thru my processes and has helped me to progress in quantum leaps always providing the safest and most secure environment. It is not easy coming from an abusive background, kidnapped, raped and struggling. Aikido set me free. I never thought I would study Martial Arts. My background is in theater, poetry, and literature. I am learning, on both a physical and a spiritual level, concepts and techniques to live fully in this life, to take chances, to stay with myself even in the midst of fear, sadness and anger. Sensei Steger as teacher takes the lead in this work, creating a place of safety and challenge where the whole of you can be received, where you can look at what is holding you back and transform fear and chaos into strength, harmony and love. Our son has flourished under the mentorship and training of Sensei Teresa. He has been taking lessons faithfully for two years now, attending twice per week. He has always been very tall for his age (we call him our gentle giant) and Aikido has allowed him to develop confidence in his ability to move skillfully and agilely within his frame. Her lessons not only assist the children with learning skills surrounding non-aggressive self-defense but also include additional concepts with regard to other aspects of their lives such as being responsible, being kind, respecting elders. Our son looks forward to each and every lesson and we feel very blessed to have found Full Circle Aikido. --- Brent & Bronwyn K.
Your classes taught me a lot more than I thought, more than just taking a fall or defending myself against violence, it gave me a self-esteem I needed to find. I’ve been promoted twice at work and I have accomplished things there that have never been completed before. Sensei, I am truly grateful. Once again, thank you for showing me how to unlock the door. My son has been learning from Sensei Teresa for over 3 years and has shown enormous growth in both Aikido skills and general life lessons. He is more confident, strong, respectful and independent from his time spent in classes. He has learned how to take his physical strength (he's a bit of a beast) and use it in a gentle kind way. I have loved watching him grow from her steady encouragement, correction and guidance.